Two months before the outbreak of World War I and in the space of ten days, the Greek population along the coast of Asia Minor is forced to abandon their homes and property and seek refuse in Greece, following unprovoked attacks by groups of Turkish irregulars. At Old Phocaea in Asia Minor, the French archaeologist Felix Sartiaux and his three assistants are carrying out excavations in search of Ancient Phocaea, the metropolis of the city of Marseille. The events that took place not only made them witnesses of the unprovoked attack but, by placing their own lives at danger, they managed to save may Greeks and help them escape. Does the art of Karagkiozi dying? No, according to Athanassiou family. 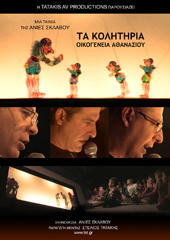 Costas, Yannis, Argyris and Helen discovered the magic of Karagkiozi in the theater of George Haridimos, one of the great karagkiozopaichtes (the "Karagiozis" player). Drifted from this magic did not remain simple spectators. Little by little they passed behind the curtain, they became assistants moving the Kolitiria figures (Karagiozis children) and after years of friction came to embody themselves the heroes of their childhood. 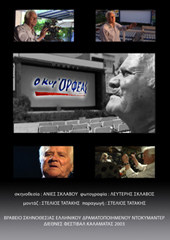 a biographic documentary presenting the life story of Lefteris Sklavos.For over 65 years he was the owner of many cinemas, making a profession out of his passion for movies. He has lived his entire life among the heroes of the big screen. Eventhough his last cinema has been demolished, his memories are still alive.He is sharing the good and rough times of his life, telling us why most people still call him Mr Orfeas.